The Walled Garden at Scampston opened for the first time in 2004. This inspired contemporary garden of 4½ acres was designed by the internationally acclaimed Piet Oudolf, winner of Gold and Best in Show at Chelsea in 2000, and his use of grasses and perennial meadow planting ensure year round interest with a late spring border for keen plantsmen. The garden is divided into a series of spaces, each with a character of its own. There is a long border walk under an avenue of lime trees containing many spring flowering shrubs and underplanting; included are Paeonia rockii, Tetrapanax papyrifer, Comptonia peregrina and Edgeworthia chrysantha. The main focus of the central area is a perennial meadow using a rich palette of red, yellow, purple and orange. The planting here is Piet Oudolf's signature style, and is designed to give a long season of interest. The garden is complemented by an excellent restaurant. 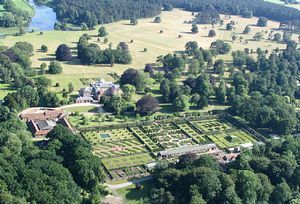 Scampston Hall is only open for part of the year (for dates see below) but is well worth a visit being among the best examples of the English Country House. Above all, Scampston is a family home and the present owners, Sir Charles and Lady Legard, take pleasure in showing visitors round. They have restored the house to its former glory and their knowledge of the family history brings the past to life. There are paintings by Samuel Scott, Richard Wilson, William Marlow and Thomas Gainsborough. The latter was a close friend of the 4th Baronet and there are many examples of his work. There is also a good collection of porcelain from Sevres and various English factories, and furniture by Chippendale and Gillows. From Leeds/York/Malton: Follow the A64 towards Scarborough. 1/2 mile after passing through the traffic lights in Rillington take the left turn signed Scampston Only and follow signs to the Hall. From Scarborough: Follow the A64 towards York passing Heslerton and Knapton. 1/2 mile after passing a right turn to Yedingham take the next right signed Scampston Only and follow signs to the Hall. From Hull/Beverly: Follow the B1248 to Malton and join the A64 towards Scarborough. Then follow directions from Malton above. From Whitby/Pickering: Follow the A169 to the Malton bypass and join the A64 towards Scarborough. Then follow directions from Malton above.